Sakai Guides and DocumentationSakai Complete User Guide Site InfoHow do I link to a parent site? Select the Site Info tool from the Tool Menu of your child site that you want to link to a parent site. Click Link to Parent Site from Site Info tabs. Zoom: Select the parent site from the drop-down menu. Click the down arrow to highlight and select the parent site from your list of courses. Review the parent course you selected, then click the Set Link button. Example: Child sites in the parent site. 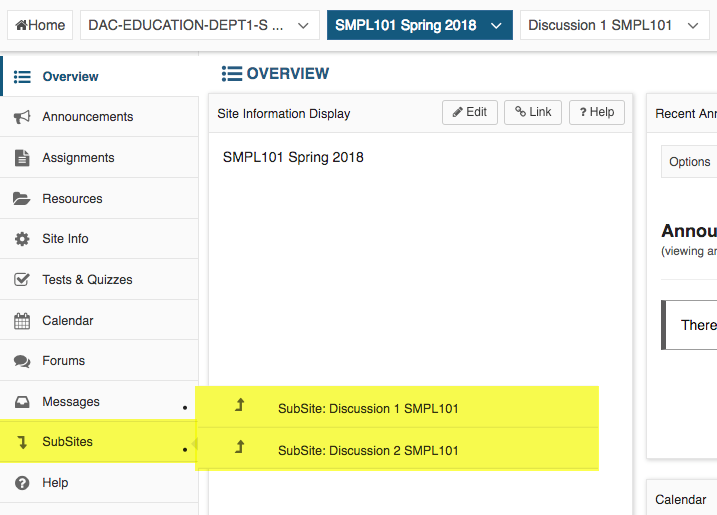 For Instructors: In the parent site, the child courses show up in the Tool Menu and can be accessed by their links. For Students: In the parent site, only the child course the student is enrolled in shows up in the Tool Menu and can be accessed by its link. Example: Parent sites in the child site.